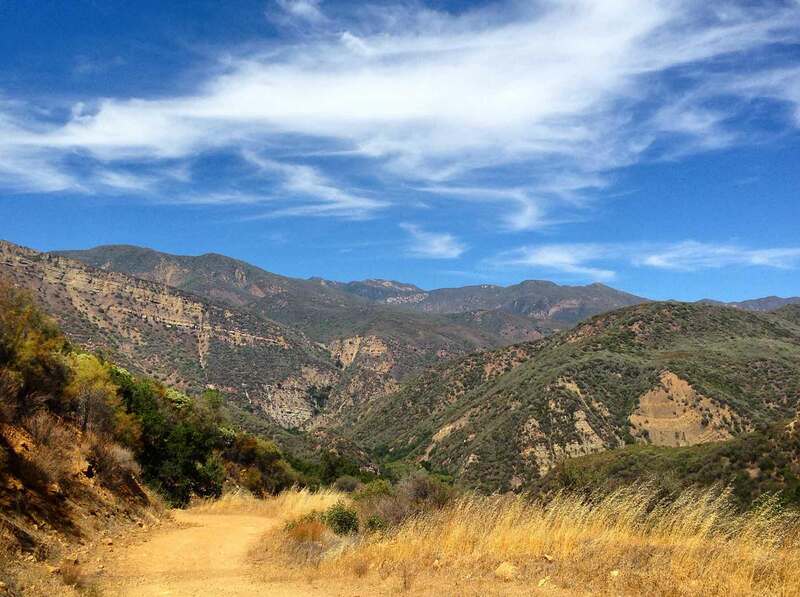 We often get asked for recommendations for day hikes in and around Ojai. From the views at Shelf Road to the mountain waterfalls of Rose Valley, we’ve collected some of our favorite hikes and listed them here. As always when hiking, please ensure that you are properly attired, are carrying adequate water and supplies, and have notified someone of your destination and approximate return time. If you do travel into the Los Padres National Forest, please check with the Ojai Ranger Station for weather and hazard information (see at bottom of page). Forest Adventure Passes are required to park in the Los Padres National Forest and can be purchased at local ranger stations. Winding along the backs of some of Ojai’s orchards, this popular unpaved road takes you along the foothills of Ojai, with great views of the entire Ojai Valley. Distance/Terrain: .6 miles (1.2 miles round trip). The hike rolls up and downhill with some steeper sections, but the road is wide and easily navigable. Directions: From the corner of Ojai Avenue and Signal St. take Signal St. north towards the mountains. At the top of Signal, the street will make a sharp right curve. Immediately after this curve take the first left to North Signal street. The trailhead is at the end of the road, with parking along the street. Notes: Shelf Road is not a loop and you will have to turn around at the end of the road to return to your car. There is little to no shade – bring a hat and sunscreen! Early morning and early evenings are the best times to go. Located off of Rice Road, the Ventura River Preserve features miles of hikes, ranging from an easy stroll to a strenuous climb. A favorite of birders, equestrian riders, and locals heading to the swimming hole, the preserve has a little bit of something for everyone. Distance/Terrain: Varies, depending on the trail. For more information on the preserve and a downloadable trail map, visit the Ojai Valley Land Conservancy. Directions: To reach the preserve take Ojai Avenue west (towards Ventura) until you reach the ‘Y’ at the Vons. Turn right onto the highway and continue past Nordhoff High School until you reach a five-way stop sign. At the stop sign turn left onto El Roblar and continue until the end of the road, where El Roblar meets Rice Road. Turn left onto Rice Rd., entrance to the preserve and parking will be on the right. Notes: Hiking in the riverbed can be hot in the summer. Make sure to bring a hat, adequate water and sunscreen. Trails are marked but a map can make travel easier. Today it’s difficult to tell that a decade ago, the Ojai Meadows was an ecosystem degraded by years of grazing and filled with non-native species. Since being restored, this natural wetlands has attracted the wildlife that had fled the area and the preserve has become a favorite destination for early-morning birders. Distance/Terrain: The preserve is a flat, unpaved trail and can be done in half an hour. Directions: Entrance to the preserve is next to Nordhoff High School. From Libbey Bowl, take Ojai Avenue west (towards Ventura). At the ‘Y’ at the Vons, turn right. Continue until you see the high school on your left. The entrance will be on your left, just past the school. A brief drive into the Los Padres National Forest brings you to Rose Valley, the Ojai Valley’s parallel neighbor. Rose Valley Falls is a 300ft double waterfall that is accessible after a short, moderate hike. Distance/Terrain: It is a .5 mile hike to the falls, with mild elevation gain. The trail can be slippery when damp, but is otherwise easily navigable. Directions: From Libbey Bowl, take Ojai Avenue west towards Ventura. At the ‘Y’ at Vons, turn right. Continue to the stop sign and go straight towards the mountains. Continue on this road for approx. 15 miles. There will be a turnoff to the right for Rose Valley Road. Take this road for about 3 miles until you see the turn off for the Rose Valley Campground. Park here for the trailhead and follow the signs. Notes: You will need to buy an Adventure Pass to park. A good place is at Wheeler Gorge station, about 10 minutes out of Ojai on your way to Rose Valley. The hike is mostly shaded, but water is a must. These stunning giant rocks are a local favorite for the great views of the surrounding wilderness. Distance/Terrain: 2.5 miles (5 miles there and back). The trail is mostly easy, with a couple of difficult spots. You will have to cross Sespe Creek. Without heavy rainfall, this is an easy crossing, with depths rarely above two feet and in times of drought, nonexistent. Driving Directions: From Libbey Bowl, take Ojai Avenue west towards Ventura. At the ‘Y’ at Vons, turn right. Continue to the stop sign and go straight towards the mountains. Continue on this road for approx. 15 miles. There will be a turnoff to the right for Rose Valley Road. Take this road for about 5 miles (past Rose Valley campground) until you come to a split. Take the left fork towards “Lions Camp.” Follow this fork until you reach the parking lot. Hiking Directions: The trailhead will be at the far side of the lot. Follow the trail until you cross Sespe Creek. After the crossing the trail will be at a ‘T’. Turn left and follow the trail to get to the rocks. This trail will take you through to the rocks. If you continue on the trail through to the other side of the rocks it will lead you along a small creek and end at a campground. Return to the parking lot the way that you came. Notes: Please wear appropriate footwear and bring adequate food, water and sunscreen. Exercise caution if you decide to climb the rocks. An Adventure Pass is required to park. All information is provided for informational purposes only. For the most up-to-date directions and conditions, please contact the Ojai Ranger Station at 805 646-4348 | 1190 E. Ojai Ave. When hiking, please make sure that you are properly equipped, have the appropriate supplies, and have let someone know of your destination.